All of our ranks are based on traditional military ranks or honorific titles that date back many hundreds of years in Europe and many are still used in both Europe and America. What you may see; however, is a slight change in order with some ranks and others are not to be found. We have customized our rank structure to suit our curriculum. We do not use rank belts as do Asian style martial arts. Our ranks are displayed by chevrons worn on the left sleeve of our uniform shirt. There is one variation in the rank system at the level of Armsman I. Members who train in steel weapons will, “Go blue,” and earn their blue chevron upon completion of their test for Armsman I. Members that train in composite or wooden weapons will earn a red chevron instead of blue at the completion of the test. Novice I – No Insignia. Novice II – 1 red chevron. Novice III – 2 red chevrons. Armsman I – 2 red chevrons, 1 blue chevron. Armsman II – 2 red, 1 blue, 1 purple chevron. Sergeant – The above plus 1 brown or 1 gold chevron depending on area of specialty. Scholar – All above plus 1 black chevron. Free Scholar – Plus a second black chevron. Provost – All above plus a black star (stars are worn above all chevrons). Master at Arms – All of the above plus a second black star. Knight – Known as a “floating” rank. 1 green chevron worn above all other chevrons. Grand Master – 1 White star atop 1 green chevron only. 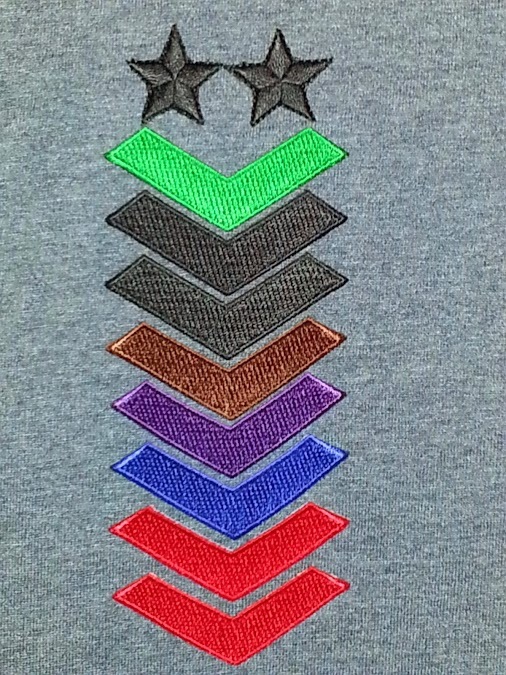 No other stars or chevrons are worn.